When someone phones about coming to church for the first time the most asked question is “Will it be all right to bring my children” and the answer is “Absolutely”. Please don’t be nervous about bringing your children with you to church – there are lots of children in our services and we welcome them with you as part of God’s family. Our Sunday morning 10.30am service is especially helpful for families. We start all together in church and it varies a bit week by week but there is always a children’s song and our famous ‘extended orchestra’ and either a children’s talk and activity in church or they go to groups in our Charis Centre appropriate to different age ranges – more about those below. There is a box of toys and books for younger children at the back of the church or we recommend bringing ‘quiet pursuits’ from home – perhaps, if you can manage it, it is best to avoid a talking doll or throwable car! Pictures, word searches and pencils/crayons are also available. 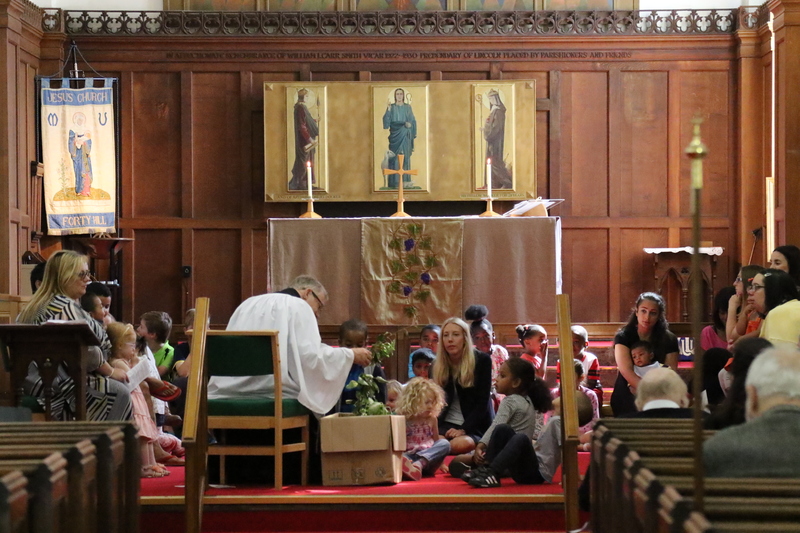 If things do become difficult or noisy during the service the vestry is open – it is sound proof but you can hear the service and see the screens from there – and there is a toy cupboard. Feel free to return to the service at any time when things settle. The pattern of services varies but you can always find out from our website what is happening this week. Each week we all start together in church but then for children up to about 11 or 12 there are groups in the hall linked to the church – called the Charis. These happen most Sundays in term time. All groups have DBS-checked leaders and helpers to look after the children. After the children’s song they leave the service and generally return near the end of the service or wait for you to collect them – it depends a bit on timing of the service. Creche Our creche is for the very youngest children aged under 2 with a parent and takes place in the vestry during the service. There are toys and activities for the children and the service can be heard from here. Tiddlywinks This group is for those who are 2 up to starting school. Again children are accompanied by a parent. It has a short session appropriate to their young age with a Bible story, song, prayers and an activity, inside or perhaps in the courtyard on nice summer days. They generally return to church together before the service ends. Junior Church There are two groups – one for children from school age (aged 4 – 6) who are happy to be left by their parents after a week or two settling in. This group meets in the large room in the Charis. The older group is for 7’s to about 11 (they move up at the start of the term after their birthday) and they meet in the room nearest the kitchen. In both groups there are age-appropriate songs, prayers, Bible stories, crafts and games. There is a mix of teaching and fun activities as the children find out more about God’s world and explore together what Jesus’ love means for each of us. Depending on the timings they return to church at the end of the service to show their work or wait in the Charis Centre to be collected by you. 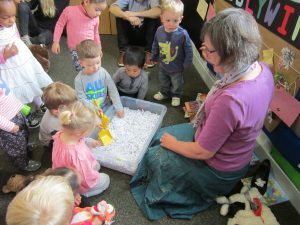 Tuesdays – Tea, Toys and Toast A group which takes place each week in term time at 9.00am which is convenient for parents who have dropped off older children at school or nursery. It is an opportunity to come along with the youngest ones and get to know other parents and babies – time for a good catch-up while the children play! The session ends with action songs to join in together. Wednesday All Age Holy Communion On Wednesday morning each week there is a communion service which is especially geared to the inclusion of young children. There is a brief children’s talk and picture to colour and interestingly we stay seated though most of the service as it helps parents with young children to settle. The service takes place in the Charis at 9.30am and all are welcome. Many families who worship with us at Jesus Church want their children to go to church schools so we do keep a register of attendance which is available after each service on Sunday and on Wednesday mornings. The Sunday and the following Wednesday count as part of the same week for attendance purposes. These days every mobile phone has a camera and we do ask everyone not to take photographs during services, and particularly photographs of children’s activities. On special occasions such as baptisms we give families an opportunity to take photographs after the service. On other occasions such as our Nativity service, parents may take photographs for private use only and not for display on any social media. Sometimes we notify people and take general pictures of an activity for our website or for use by the Vicar in the notices – If you have a particular concern about this please do ask to be shown the photographs before they are published. Throughout the year there are a number of special events as we are a friendly parish and enjoy lots of different activities – craft days, social events, even work parties in the grounds, which are also easy for parents with young children to join in. Our events page has news of these and we look forward to welcoming you!